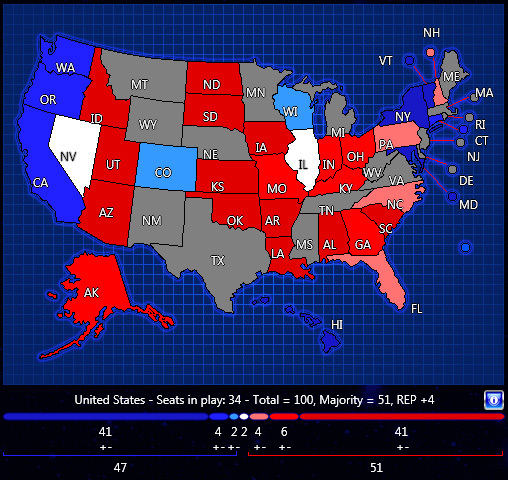 Senate 2016 has just been added to Congress Infinity, and the map below shows how things are looking right now for the 2016 Senate elections. The 2016 cycle has 34 seats up for election (at this point). 24 are where the incumbent party is Republican, 10 where it’s Democratic, so almost 2.5 times as many Republican seats are up for election than Democratic. That sounds good for Dems, but a Senate victory has to come from individual seat wins – which seats could they capture to net 4 or 5 seats (depending on who wins the Presidential election)? Looking at the details and assuming there isn’t strong sentiment for one party or another, the map doesn’t look as easy as you might think given the sheer number of incumbent Republican seats up for election. At this early stage, it looks like there are 10 seats that have a significant chance of changing hands, 7 Rep and 3 Dem. First the possibilities for Dem pick-ups, with the candidates we’ve put in against them for now and the percentages they start with in the latest internal version of Congress Infinity. An interesting element to this is Rand Paul’s KY seat, where Kentucky law seems not to allow his name to appear on ballots for two offices simultaneously. My guess, though, is that Paul will figure out a way to run in the Republican Presidential primaries and have his name on the Kentucky Senate ballot. Yet, even if Dems capture 4 seats and the Presidency, they have to make sure they don’t lose any. Here are 3 seats that could be close, where the incumbent candidate is Democratic. Reid won a relative squeaker last time, 50.3% to 44.6% against a weak candidate. Gov. Brian Sandoval has been polled beating Reid. After incumbent Sen. Mark Udall lost his seat to Republican Rep. Cory Gardner in CO, it seems like Bennet’s seat might be a plausible Republican target. A big question for either party is where there will be open seats – soon, Senators should start announcing whether they intend to retire after the 114th Congress, and there’s the possibility of successful primary challenges to incumbents. I agree with everything but Wisconsin. How about a primary so we can get different people taking on the incumbents. Primaries would be great. They seemed to cause a lot of bugs in President Forever 2016 but it would be great to have them nonetheless. I might think about primaries for CI in the future. It’s a very different sort of process than in PI, because you’re playing from the perspective of the party. I don’t know if he’d run or who he would run against, but it would be interesting to see if Ted Kennedy Jr goes from the state senate to the US Senate in CT. I predict Joseph Kennedy III will go to the senate in MA if Markey ever retires or if Warren takes a cabinet position or VP. Now that I’m on the topic of descendants of famous politicians, I could see Jason Carter going for a Senate seat in Georgia. George P. Bush could try to take on Ted Cruz, if Cruz pisses off enough Republicans. These are just options I’d like to see if a primary setting is created for future elections. However, I think they only have a 50% chance or less of actually happening. As someone who lives in Wisconsin, I have yet to even hear Feingold’s name come up as a likely opponent for Ron Johnson. I do know Ron Johnson won Feingold’s old seat though, so I guess it’s possible. But, I like the idea of having this feature, and you guys have been pretty good about updating changes as they occur. So, why not have Feingold? I’d probably start the percentages in Wisconsin a little closer though. Michelle Nunn might run again in Georgia for 2016. Rand Paul may face a challenge from Grimes or some other Democrat. In California, Boxer or Feinstein might retire and we could have either Facebook’s Sandberg against HP’s former CEO, Fiorina. I think that Charlie Crist should be made the Democratic candidate for Florida. This would be his first time running for the Senate as a Democrat and I don’t think Schultz would eave her DNC chairmanship to run for the Senate. Also, I think that Mary Landrieu will run for Vitter’s seat, since she wil lose the seat this time around and Vitter will probably run for Governor of Louisiana. This would allow Vitter to appoint his own successor, which could be Rep. Charles Boustany or Rep. John Fleming. Thanks for this feedback – I wouldn’t be surprised if Crist entered the Democratic Senate primaries – we’ll see. It sounds like Vitter may run for Governor of LA, so you might be right about Landrieu also. If you hear more about this, feel free to post links as these things develop. Perhaps a feature could be added where we could select the candidates to run in the Senate elections in 2016? For example, in Kentucky, it is likely we could see Grimes run again, or Adam Edeland (against Paul (who just said in a Salon interview that he is running for the U.S. Senate in 2016) or one of the Republican candidates for Governor in 2015. Since we are bringing back the election night race calls, we should allow the national campaigns to give money to the campaigns in states, which was in the 2010 and 2012 campaigns. Thanks for this feedback. I’ll look into adding the ability to distribute funds when implementing the feature of Surrogate fundraising. Next update for CI will probably be in about 2 weeks. There’ll be a blog post once there’s an estimated date. Whoever is in charge of the candidates must read this. But with the primaries,I think you should manage who should win the primary. For example, if it was the california senate race, barb boxer and Sheryl Sandburg, as the party leader, you should decide who would be the best guy to win the nomination. You should, in the primary, spend money on who you think has the best chance. I think you should probably add Scott walker and Paul Ryan. Thanks for this feedback – lots of those candidates sound like realistic possibilities. Suggestion about allowing selection of candidates noted – I think that would add significantly to game play. Also, another note. In arizona, I think J.D. Hayworth might like revenge on john McCain, and choose to challenge him. Also, some other scenarios, scott brown, who lost his senate race, might want another run, (which could be disastrous) so another major guy. Also, tom daschle might run in South Dakota. Here’s an idea. Like president forever, each senate state up for election should have its own candidates section. The republicans would have their own section, so would dems and other parties. You could decide who you want to run in the primary, or you could go straight to the general election. I think we should bring back edorsements, either major VIPs endorsing single candidates or parties. Also their are certain races that shoul not be deep red. Arizona and georgia shouldn’t be. Yes, endorsements might be added to Congress Infinity at some point – thanks for this feedback.